The Only Honest SlotsMagic Casino Review You'll Ever Need! See now! SlotsMagic Casino is dedicated to delivering to its player “A Galaxy of Slots”. 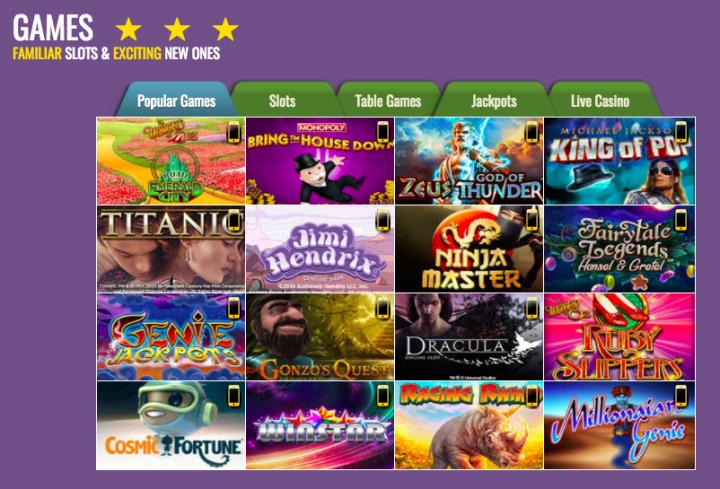 With well over 600 games from industry software juggernauts like Microgaming, NetEnt, WMS, and many more, there are many amazing titles, including jackpot slots. In addition to its excellent range of games, which also include table games and a live casino, SlotsMagic offers players a generous welcome package, daily offers, daily tournaments and a solid VIP offering. Established in 2014 and powered by SkillOnNet, SlotsMagic.com provides a thrilling, safe, reliable, responsible and multilingual digital gambling environment. SlotsMagic has plenty of exciting bonuses and rewards that you can enjoy, regardless of whether you are a new or regular player. To start things off, new players who signup are given the option of taking advantage of a solid welcome offer that includes both a generous match bonus as well as free spins! Claiming this offer is easy. You simply need to be a resident of a permitted country, be the appropriate age, create a real-money account and make your first deposit. The match bonus and free spins amounts change on a regular basis, so be certain to check what’s being offered when you sign-up and make sure you have the proper bonus code to claim the rewards (standard bonus terms apply). In addition to the welcome offer, SlotsMagic also has time-limited promos as well as daily buy-in and freeroll tournaments and new offers every day with its Daily Picks promotion. Each day, with Daily Picks, you can claim one of multiple offers that are up for grabs and handpicked just for you. These may include match bonuses, mega spins and more! There’s also a multi-tiered VIP Lounge available to all players interested in obtaining exclusive VIP perks. 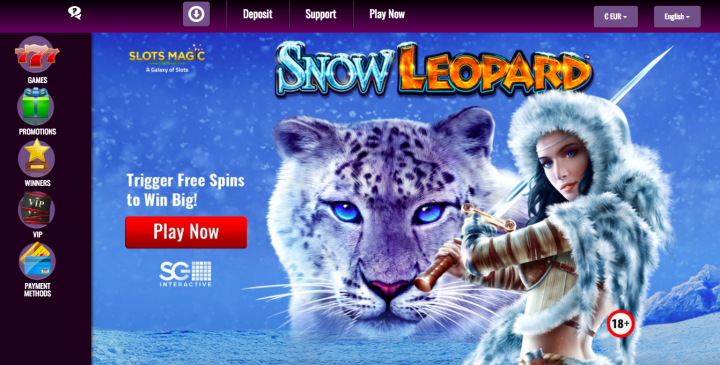 Free spins are a part of the welcome offer at SlotsMagic. No matter the number of free spins you may be able to claim, what’s truly fantastic is that free spins are wager-free. This means that any wins from free spin winnings (up to a maximum of €100) are yours to keep playing with or you can withdraw them at any time, even if another bonus is still in play. You’ll find over 600 slots at SlotsMagic.com, among which include classic 3-reel slots, video slots with bonus features and multiple paylines, licensed slots, and progressive jackpot games. A taste of the casino’s popular titles include: Zeus God of Thunder, Jimi Hendrix, Gonzo’s Quest, Starburst, James Dean, Millionaire Genie, Flip Flap, Raging Rhino, Titanic, Ninja Master, Medusa II, Mega Moolah, Divine Fortune, and Blazing Star. There are plenty of reels to spin and – in the case of progressives – millions to be won! Of course, SlotsMagic offers more than spinning reels. Several variants of Video Poker, Blackjack, Roulette and Poker are available among other table and card games. A live casino that includes multiple versions of live blackjack, roulette, poker and baccarat are also an option, delivering a variety of genuine fun and interaction in real-time with live human dealers. SlotsMagic delivers its “galaxy of slots” via the incredible talents of some of the best software developers in the industry. These include pioneer and leader Microgaming, the uniquely innovative NetEnt, the 3D gurus GVG, the prestigious and popular German developer Merkur, and WMS, the masters behind many licensed slots. Other exceptional developers who have contributed to SlotsMagic’s incredible range of slots include NextGen Gaming, Amaya, Barcrest, Bally Technologies, and Blueprint Gaming among others. As for its live casino, their topnotch live dealer experience is powered by the genius of Evolution Gaming, Xpro and Novomatic’s Extreme. No matter what you play at this casino, you can expect amazing graphics, sounds, animations and an overall thrilling experience. It likely won’t come as much of a surprise that SlotsMagic offers a mobile casino. What is impressive is the casino’s premium HTML5 mobile software, which grants smartphone and tablet players access to seamless entertainment that includes a broad range of slots and table games. Plus, navigating the fantastic layout is made easy and simple with user-friendly features. This state-of-the-art mobile experience is available for both iOS and Android devices. SlotsMagic Casino accepts most of the commonly used and recognized payment methods you’ll find at many online casinos. These include eWallets (e.g. Neteller, Skrill, and PayPal), Credit and Debit Cards (e.g. Visa and MasterCard), Prepaid Cards (e.g. Paysafecard), and Bank Transfer. However, the above is only a taste of the banking options the online casino supports. There are over 30 options, and several of the payment methods available at SlotsMagic are country-specific, catering to players from different nations. There are 10 currency options including: GBP, EUR, USD, CAD, AUD, ZAR, SEK, DKK, NOK and RUB. That being said, it is important to note that not all deposit and withdrawal methods are available to all players or in all supported currencies. Moreover, some of these banking options are linked to fees. Therefore, it is important to check the cashier to find out which payment solutions are available to you and if there are any fees. As for withdrawal processing times, these are fairly quick. This is especially true for most eWallets, where same-day cash-outs are possible. SlotsMagic’s customer service is multilingual, friendly, professional and dedicated to delivering first-rate support 24 hours a day, 7 days per week. There are three ways in which you can directly get in touch with the highly-responsive team: Telephone, live chat and email. No matter your queries or concerns, you can obtain speedy answers. A detailed FAQ is also available if you want to take a self-help approach, especially if you are looking for answers to the most commonly asked questions regarding accounts, bonuses, payments, and so on. SlotsMagic is licensed and regulated by the Malta Gaming Authority and the UK Gambling Commission. It has also received accreditation from Casinomeister, a well-known advocate of fair play in the iGaming industry since 1998. The casino and its software has been certified safe, and fair. The privacy of players’ financial and sensitive data is fully protected by industry standard security protocols (128-bit SSL data encryption technology). SlotsMagic also supports responsible gambling practices, ensuring a safe, respectful and reliable online gambling environment for all to enjoy.